Folks, How Adorable Is This Rabri Faluda Cart Stationed In South Delhi? After a short stint of being outside City Socialite Cafe in SDA, Rabari Faluda Express has moved over to Jia Sarai bus stand, close to the RK Puram Metro Station. This lovely little ice cream stop does only two types of rabri faluda in glasses for INR 40. The cart’s run by an IHM Graduate who did extensive research on everything he could sell via a cart. He even did the branding and the design himself, and called it 'Express' to convey a grab-on-the-go feeling. We love that he's promised to get the nearby area cleaned up and wears plastic gloves and hopefully, we’re going to see way fewer flies hovering around the next time. So, the good news is, both the classic and fennel flavour of his rabri faluda made us happy after a long, tiring drive. If we were chilling close to IIT or SDA, we’d sure go looking for this good, wholesome Indian dessert in a heartbeat… This faluda is childhood in a glass, really. 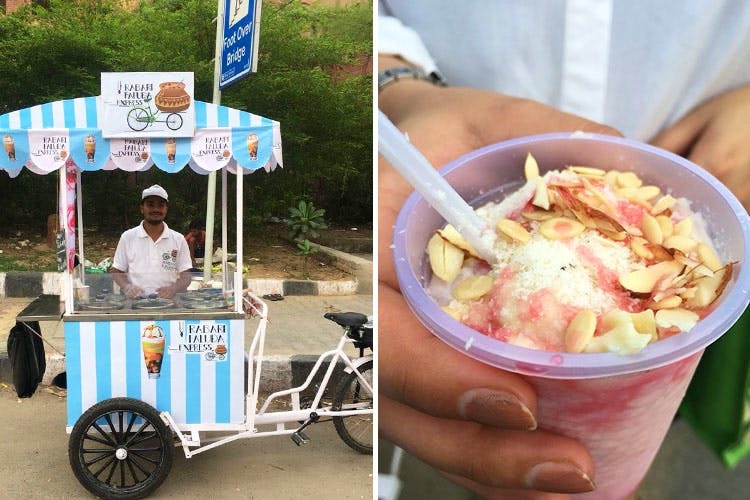 The intention is to have a lot of these mini carts scattered across different South Delhi locations, but we had a hard time keeping a track of Rabari Faluda Express’ whereabouts. After a week of coordinating though, we found them. Sure, we weren’t disappointed with what they had to offer, per se, but the search wasn’t the most pleasant part of this dessert run. Call the smiling and ever-helpful cart man if you don’t find him under the metro station. He’s currently battling the MCD in the hopes of finding a permanent location, and we’d really suggest ringing him up (8076356455) if you’re going to make a trip.